While weeding the garden on a hot Saturday afternoon I suddenly saw a vision of a kiwi. During the next couple of days the vision developed further. I first saw the kiwi poking around in the dark on the forest floor, unearthing its edible treasure. I then saw the night dawn into day and, surprisingly, the brave little kiwi did not scurry into the safety of its burrow. It chose to stay in the light and raised its beak heavenwards. As I watched on in the vision the little humble kiwi morphed into the fearsome Hokioi, or Haast eagle. The short-sighted flightless defenceless kiwi became a far sighted, imposing eagle that no-one would dare rouse from its lofty heights. The kiwi changed into the Hokioi, but its heart remained humble. As I mused over this vision over the next couple of days I was reminded of the hobbit Pippin at the battle of the Black Gate in the movie ‘Lord of the Rings – The Return of the King’. Under attack from the air by the dreaded Nazgul, Pippin suddenly shifted his gaze and shouted in relief, “The Eagles are coming! The Eagles are coming!” The eagles swooped and fiercely attacked the fell beasts upon which the Nazgul rode. I believe this is a prophetic picture for us in New Zealand. [The Kiwi – symbol of NZ. It is nocturnal, has nostrils near the tip of its beak and prods in the forest floor for edible treasure. It is vulnerable to predation from cats, ferrets, stoats, weasels and rats]. 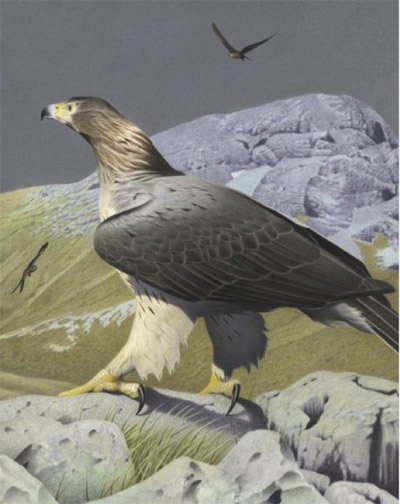 [The Hokioi (Haast eagle) – largest and heaviest eagle with a wingspan of up to 3 metres and with feet and claws the size of a tiger’s. Females were up to 17kg with males up to 12kg]. Otto Roverts is married, with 4 adult children, and lives in Christchurch. His day job involves working in an electricity company looking after their IT needs. He is a member of Grace Vineyard Beach Campus where he serves as part of the Prayer Ministry team and the Welcome team. In term 3 he will be involved in teaching a Prophetic Training course at his church.